This is not a review of the much-talked-about movie “Boyhood”. I haven´t even seen it yet. This is just me talking about an article I read about it´s maker: Richard Linklater and why it makes me feel good. My brother in law Spike left us a bunch of issues of The New Yorker. Yesterday I grabbed a stack of them and headed downstairs to our basement. The only place in our house that is cool at the moment. I loaded the washing machine and made room for me on one of my many couches. Before I sat down I checked the couch for spiders (it´s a really small couch, only two seats, more like a loveseat really), and pulled an old TV closer so I had somewhere to put my coffee cup. Behind the TV I found a bag filled with “missing socks” that had been gone for quite some time. “Great I´ll deal with them later” I told myself but thought in my head: Make that much later Jenny. Who needs socks now anyway? it´s too darn hot. Everywhere I´ve looked lately people are talking about this new movie Boyhood. 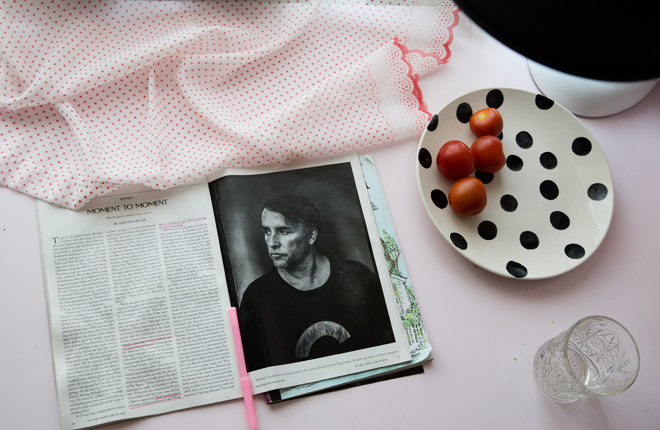 And the first article I settled on in Spike´s magazines was about it´s maker Richard Linklater. It´s an interesting read about his way of work and of the making of Boyhood (which looks really good by the way). You can read it here: “Moment to moment. Why Richard Linklater makes movies”. Linklater stays put in Texas even though “everyone else” is in Hollywood making movies. If he has a meeting there he takes the morning flight and he goes home straight after the meeting. He involves his kids in his movie making, and that seems to be fine. And he is not pretentious. Reading that last line made me scream of joy from my loveseat in the basement. If there would be any spiders this is when they would run and hide. Upstairs I imagine Jens and the kids hearing me scream through the floor boards, just looking at each other in understanding, shaking their heads and then going back to what ever they were doing. My brain has asked myself that question so many times when I´m out working, photographing something or someone and the subject gets too messed with: Polished, brushed, tweaked, straightened, ironed, moved and improved into perfection. I can´t stand perfect. But I keep forgetting that. So to remind myself of this I´ve written that quote and taped it to the tiles of my kitchen. (see picture above). Now it will remind me everyday just like the sign on our door saying “FRUKT” is reminding Viola to bring a fruit as a snack to school. Below is the trailer for Boyhood. Not only does it have Patricia Arquette in it but also lots of scenes from “everyday life” in the US so it should be great. Since I don´t like theaters (well I guess there is nothing wrong with the theaters really just the people in it) I´m waiting patiently until I can buy it on Itunes. This clip makes me smile. I love how the kids are so dignified and the parent is all over the place (it reminds me of me talking to my kids). The kids are played by Ellar Coltrane and the directors own daughter Lorelei Linklater. Let´s flush perfection down the drain!